An unfortunate "misunderstanding" between GenCon Indianapolis and the Christian Children's Fund has derailed a hefty donation to the charity that was meant to honor the late Gary Gygax. 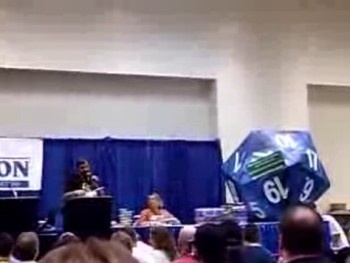 Each year GenCon holds an auction and other events to raise funds for donation to a chosen charity, and after raising almost $10,000 for Christel House in 2007, for 2008 it was decided to honor the late Dungeons & Dragons creator by sponsoring the Christian Children's Fund, described as Gygax's "favorite charity" and one he had donated to personally many times in the past. The auction raised over $17,000, highlighted by the sale of a six-foot-wide 20-sided "Gygaxian" die, which ultimately went for $1500. According to a report by Live Game Auction, all was well until the CCF discovered that some of the donation would come from the sale of Dungeons & Dragons merchandise. Apparently the whole monsters/devils/Tom Hanks stigma still drips from the game like the pungent stench of mildew that emanates from wet dungeon walls, leading the CCF to decline the donation. As a result, the Fisher House Foundation, a charity that supports wounded U.S. soldiers and their families, became the beneficiary of GenCon's generosity. Predictably, gamers familiar with the situation were deeply slighted by the CCF's refusal to take their money, particularly as the donation was meant as a kind of memorial to Gygax. Giant in the Playground posted an article describing the affair, saying, "The charity refused due to the fact that the money was raised partly by the sales of Dungeons and Dragons materials, which as we all know, puts an irrevocable taint of evil on the filthy lucre that us demon-worshipping gamers might want to use to, say, donate to starving children. Not only is this a slap in the face to every gamer, but it is especially insulting to Mr. Gygax himself, who I understand donated to their cause many times over the years. Plus, I'm sure the children who would have gotten food or clean drinking water with that money would be sort of upset, too." But according to Cheri Dahl, vice president of international communications and fund raising at CCF, the uproar is the result of a "misunderstanding" that appears to have caught the charity by surprise. "When GenCon contacted CCF about its auction, we were pleased to accept donations. However, we couldn't lend our name for publication because our policies have specific criteria for endorsements," Dahl said. "We were unaware that this had caused any problem or concern for GenCon until we began receiving emails." "This decision was in no way intended to be a reflection on Mr. Gygax, gaming enthusiasts or the game Dungeon and Dragons," she continued. "We have the utmost respect for the gaming community and were touched by the generosity expressed through your auction. We were disappointed that we were not the recipients of the donation but we were pleased that another worthy organization benefited." I've asked Ms. Dahl what "specific criteria for endorsement" the CCF insists on that prevented its association with GenCon, but at this point things appear to be not so much sinister as simply the result of poor communications between the parties involved. And, as Dahl pointed out, the gaming community was still able to contribute to a different but nonetheless very worthy charity; not necessarily the ideal outcome, but one to be proud of nonetheless. So it's exactly as we all thought, they refused because of the D&D connection, then did a public address backpedal to save face. Yeah, go frak yourselfs CCF, hopefully some other charity also covers the same kids you just robbed of a good meal and clean water all for the sake of dated and misguided religious buttfuckery. So, a specific endorsement criteria stopped them from accepting the donation. The endorsement criteria being, "No money from devil worshiping children"? Ugh, this pisses me off. Not just because the "OMG D&D IS TEH DEBIL" mindset actually exists, but they allowed starving children to suffer because of it. I'm sure God is pleased! Mavis Beacon is going to call you up. I can't stand thse christian organisations, they are so backwards. I am honestly foaming at the mouth right now. Heh, Kudos to Malygris for the "Mazes and Monsters" reference. I'm assuming you've seen "Dark Dungeons?" Personally, I'm just tapping my Gencon resources to see what they thought of it. It's an unfortunate stigma, perpetuated in the 80's by hysteria and fear brokers such as Mr. Jack Shick. Even my parents who are the most down to earth and sensible people ever bought into it, and I was commanded to stay away from magic the gathering and D&D for many years until late in highschool when I attended a few games without their knowledge and told them about it. When they said it was occult, I said "No, it's really not" and that was the end of it- because being sensible human beings they believed me as I had been raised to be honest and forthright with them. OMG GOOD PARENTING!? Yes, I had very good parenting. The point is, this sort of hysteria doesn't go away easily. A much more serious and endemic example that can be taken is racism- in the past it was all supported by public fear mongering and bogus films and comic strips and tracts depicting minorities as pyschotic chariacture's of stereotype tropes. This was also the technique to illegalize Marijuana, which to this day is the most overhyped 'illegal' substance. It was only 20 years ago that it was 'accepted' that D&D = Satan, and religeous groups are very slow to change their attitudes and opinions on things. When I was a kid I actually saw a Christian Magazine that 'debunked' Carbon Dating. And this was in the church library next to 'The Lion The Witch and The Wardrobe'. 20 years is not nearly enough time to undo ALL the damage, particularly amongst the older and more stubborn demographics. I wouldn't worry too much about it, I doubt much of that money would have actually gone to starving orphans anyway. I know everyone is ready to get on the "hating CCF" bandwagon here, and believe me I have been on that myself. What if they're telling the truth? GenCon's auction people posting that was like shouting in a theater. A dangerous thing to do even if there is a fire. I want to see some sort of documentary evidence here. From both sides. The issue is I have a hard time believing that such a large donation would fall through the cracks over an endorsement misunderstanding. That's the type of thing that people pass up to those in the know to review multiple times. It smells of major backpedaling, but either way, there's plenty of charities out there. So it's not like good people will have problems giving money to a worthy cause. Surprisingly, the Christian Children's Fund is a nonsectarian organization that does not preach any religion or message. They were founded by a Presbytrian minister back in the 1930s, but since then maintain the name primarily because they espouse many of the same values, mainly 'love they neighbor' and care for children. Both the organization itself and at least one Christian group acknowledge that the CCF is not religiously affiliated. Irony can be so ironic. It still smells fishy to me. OK, I am a Christian and I play D&D. There is nothing Satanic about it, and even if there was, it shouldn't matter where the money comes from so long as it can be used to help someone.